Bridge kitties: when is your bridgeday? My bridgeday is November 24, 2004. My mom will always love and miss me. I joined Catster on April 30, 2005 and am very happy to have met so many kitty friends. My 1st BridgeDay was January 25, while I miss my mom and mom misses me, we both decided to make it a day of celebration. Celebrate life and love. To remember only the good times and all the love that we shared. My BridgeDay was also the 6th BridgeDay of my grandmom and we had a lot of happy memories to remind us of all the love of my mom and her daughter. This wasn't easy to do but it did make it a little easier to make it through the day. :c9 I invited all my friends here on the 'bridge' to join me in the celebration, it really was a beautiful day and more good memories were made. May 1, 2006 is when I crossed the bridge. Mom already has the date marked on her 2007 calendar (as if she could ever forget). I just had my 1st bridge-day anniversary on January 24 of this year. Mom was very quiet all day long, and everyone kept asking her what was wrong. I was the first of three to cross the bridge in 2006 -- what a yucky year! my 5th bridge day is March 15 . I went to the bridge after a long 9 mouth stuggle wif FIP my brother mu shue misses me very much along wiff my Mama Laura. Abbie's bridge day is February 8, 2006, so we just completed our first year without our sweetheart. At least I know she's in a wonderful place, being a funny, sweet kitten again. I'm glad she's got so much company. My Bridge Day is December 22, 2005. My one year anniversary just passed and my mom had a rough time. She still gets so sad when she thinks about me although she knows that I\'m happy here at the Bridge and not suffering now. My other brothers and sisters don\'t have pages here (someday my mom will figure out how to use her scanner) but I\'d like to mention them here: Jennifer: April 1977 - January 11, 1995 Pete: April 1977 - July 23, 1993 Calico: Spring 1965 - Summer 1984. 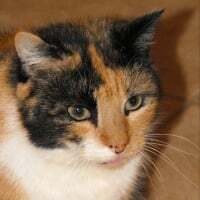 (Calico was truly blessed because she died in her sleep). I'm not quite sure when mine was. Sometime in Feb. 2001.. It doesn't seem like it's been that long to mommy and she still missed me everyday. My 5th year Bridge anniversary was May 2, 2007 --- which means (duh!) I came to the Bridge on May 2, 2002. My Mom still misses me. My bridge day is March9, 2007. It isn\'t even 5 months yet and mommie says she misses me every day. Lately, she is seeing a lot of my traits in Mufasa (especially the climbing-we both like to be up high) and that has been making her smile.